The parliamentary vice-president from Fidesz -- the largest faction in the Hungarian government -- has asked parliament to "ban communication devices that [law enforcement agencies] are not able to surveil despite having the legal authority to do so." However, the Fidesz rep Gergely Gulyás either doesn't know what he's talking about, or he doesn't care, as what he seems to be asking for is a rule requiring smartphone app stores to remove cryptographically secured messengers, like Imessage, Whatsapp, Wickr, Hangouts, etc. This would not stop surveillance targets from using foreign versions of the app store, sideloading cryptographically secure apps, or using cryptographically secure desktop apps. In other words, it would have virtually no impact on the ability of those conspiring to commit crimes to hide their communications from the security services. Hungarians have a healthy suspicion of mass surveillance, a legacy of the country's years under Stalinist police-state rule. However, nationalist/populist/xenophobic movements within the country have grown in recent years, and with them, a tolerance for an authoritarian state, provided that it focuses its energies on political dissidents, migrants and foreigners. The ruling party’s goal is simple: it wants to legalize mass surveillance of Hungarian citizens. Currently, Hungarian law enforcement agencies already have the authority to tap phones, log internet traffic, search private property, plant bugs, etc., but all this must be done with the approval of a judge (something like a warrant). However, the current legal framework in Hungary also allows for law enforcement agencies to conduct surveillance of individuals within the framework of counter-terrorism operations. A recent ruling by the European Court of Human Rights in Strasbourg shot down this practice in Hungary, but the legal framework allowing it to continue has yet to be modified. The Fidesz government would now like to lay a legal foundation that would make mass surveillance of citizens possible in an effort to thwart any potential terror attacks. (Image: "To Arms! To Arms!" 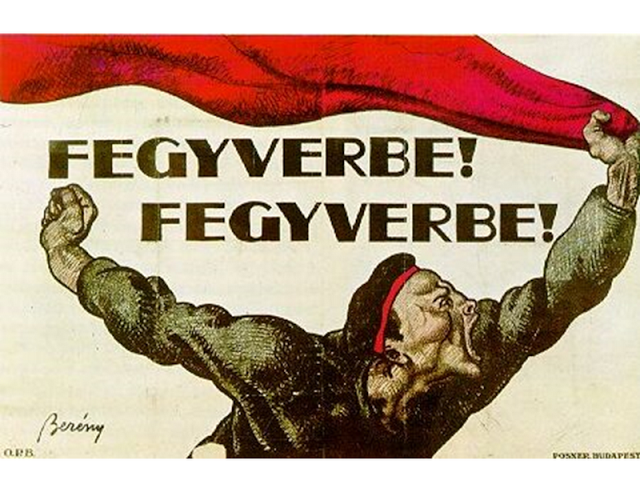 Bolshevik Hungarian propaganda poster from 1919.